Like the grains of sand in the drip of time, so are the days of Julian Assange holing up in the embassy of Ecuador. Syria’s Bashar Assad formally accepted the UN’s Peace Plan, as presented by Kofi Annan, and then he twisted its meaning to his liking. Laughzilla took a shot at the dictator’s arsenal of political percptions with this How Assad Accepted the UN’s 6 Point Peace Plan Editorial Cartoon, originally drawn and published for The Daily Dose on March 30, 2012. This political cartoon of the Syrian Six-Shooter was drawn from the hip to give artistic oxygen to the #OccupyNGOs movement, because the top 1% of technocrats should not control over half of international institutions of issues. 10. So if America won the war in Iraq, and to the victor go the spoils, then why is China (which opposed the war) the big winner of free Iraq petro-dollars? 9. Now that Kim Jong-Il is with his maker, will he be known as the “Eternal Beloved Leader” or “The guy with the weird hairdo that we’re glad to get rid of”? 8. Since North Korea is no longer run by li’l Kim, what’s the rap on their nukes? 7. After learning of the death of the North Korean dictator Kim Jong-Il, conservative Democrats in Washington were wondering, WWBCD – What Would Bill Clinton Do? 6. You can try to #OccupyHistory with revisionism all you want, but in the end, all the poisons slip out. 5. Following the death of Lil’ Kim Jong-Il, the American rapper known as Lil’ Kim can no longer pursue her trademark infringement suit against the bouffant loving short tyrant in plain counter-culture suits. 4. If you Occupy History books, does that mean you’re preventing the other 99% from reading them? 3. The war in Iraq is over. Osama bin Laden is dead. Lil’ Kim Jong-Il is dead. A bunch of Arab dictators are dead, ousted from power, or under great pressure to leave office. People power is reversing many of the acts carried out by the administration of President George W. Bush. So … why is the economy still in the tank? 2. Can you really occupy history if you can’t even occupy the present? 1. If you have to read between the sheets just to learn the facts, you might be someone who likes to Occupy History. Reference: Yasha Harari for TheDailyDose.com. 10. Economy: Frustrated by high unemployment and low salaries? Learn to make things that go “Ka-Boom!” and make money on the Afghan market. 9. Food: In Kabul, a new chain of sweet food vendors are marketing an Afghan version of the Cinnabun, called the Talibun, available until the Allied forces complete their withdrawal. 8. Irony: In 2011, the Nobel Peace Prize was awarded on the 10th anniversary of the US-led military operations in Afghanistan and the ongoing War on Terror. 7. Technology: Would drone strikes and the War on Terror be as unpopular if instead of exploding things, they were planting cash crops? 6. 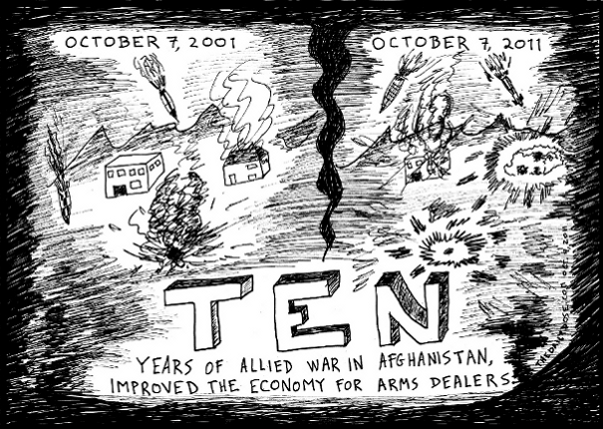 Iambic Pentameter: Ten years of the war in Afghanistan were launched by the acts of a now dead man. 5. Politics: Politicians don’t kill people in war. People kill people in war. Proof that politicians are not people. 4. Haiku: Osama went nuts. He attacked America. Ten year wars take guts. 3. Internet: You can’t solve the War on Terror with a social network. It takes a killer app. 2. Religion: Like the battle of religion and skepticism, both sides are in it to win it. They believe their way is the only winning way. Yet at least one of them will be wrong. 1. The Beach Boys are very disappointed that after a decade of the War on Terror, America has yet to bomb bomb bomb, bomb bomb Iran. 10. People who complain that Obama takes too many vacations should at least be thankful that on those days he’s not around the office spending more money. 9. You know President Obama can’t be sleeping too much, not because of his job, but because of all the time he spends chatting online. 8. The truth is that President Obama has taken far fewer vacation days than his predecessor, because as he put it, he’s still “cleaning up the mess” Bush left for him at Camp David. 7. If you were to grade President Obama’s Job Performance, you would have to consider the fact that he inherited policies he did not like, and faces a lot of politicians that don’t like him. 6. You can’t judge President Obama’s job performance by his results alone. Remember, he has Dreams of his Father. 5. If President Obama were performing any better at his job, the White House would be flooded with angry phone calls … from China. 4. The job performance of President Obama isn’t black and white, or something you can judge in three years’ time, but it is something you can understand the day after the 2012 presidential elections. 3. When you think that all is lost and America is going down the tubes, just remember, YouTube is an American company, and President Obama gave you an endless font of Hope and Change. 2. Don’t blame President Obama for the State of the Union. He’s just stars as the messenger in the current Act of political theater. 1. President Obama’s Job Performance can be summed up in three words: Miss Clinton Yet? 10. 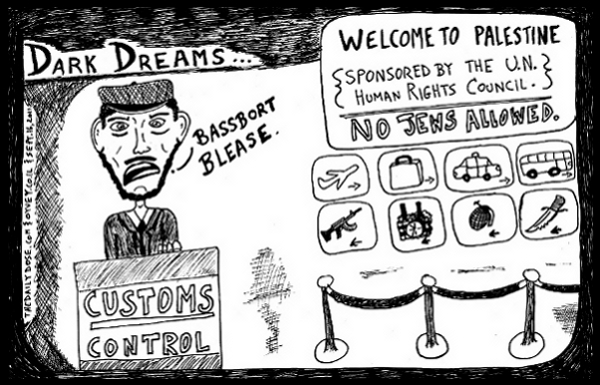 In the future, Palestine will be open to all … except Jews. 9. In a future Palestine, everyone will be entitled to jet-packs and floating sky cities, and everything will be hi-tech, and it will last, as long as they take out all the embedded self-destruct ordinance. 8. The future of Palestine depends less on Dreams of their Fathers, and more on dark dreams of killing Israelis. 7. The Future Palestine will be equitable, with liberty and justice for all, except Jews. 6. The Future of Palestine believes that Palestinians and Israelis should be separated so that their nation can develop without conflict, which is why NASA just announced its newest mission: Build a rocket large enough to transport the entire PLO and Hamas to Mars, aka:The Bringer of War. 5. The future Palestinians will be glad to finally have a nation of their own, where they can be cowed into submission, oppression and fear by their very own terror-sponsoring dictators. 4. In the future, Palestine will rewrite all of its history books – again – to teach their children the most updated, incorrect revisionist history they can afford. 3. The State of Future Palestine will have a GDP far exceeding its needs, as long as donor countries keep getting suckered into bailing out the deficit spending of the bankrupt ideologies known as the PLO and Hamas terrorist groups. 2. The Future Palestine will be a pleasant, lovely, charming, picturesque, quaint for every Islamic Jihadi Shaheed to visit, especially after the Palestinians remove every last trace of the thousands of years of Jewish presence in Judea and Samaria. 1. In the future, if a peace agreement is ever signed between Palestinians and Israelis, something will happen that has never, ever happened before: There will be a State of Palestine. 10. Carlos Latuff may be a good, if misguided soul, but you wouldn’t know it from reading his cartoons. 9. You may think it’s unfair to single out Carlos Latuff for satire, and then you’d be an idiot who doesn’t understand the meaning of free speech. 8. 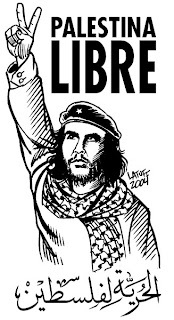 Carlos Latuff wants freedom for Arabs … to destroy Israel. 7. Political cartoonist Carlos Latuff compares Jews to Nazis and Palestinians to Jewish Holocaust victims, which is perfectly logical to ignorami. 6. 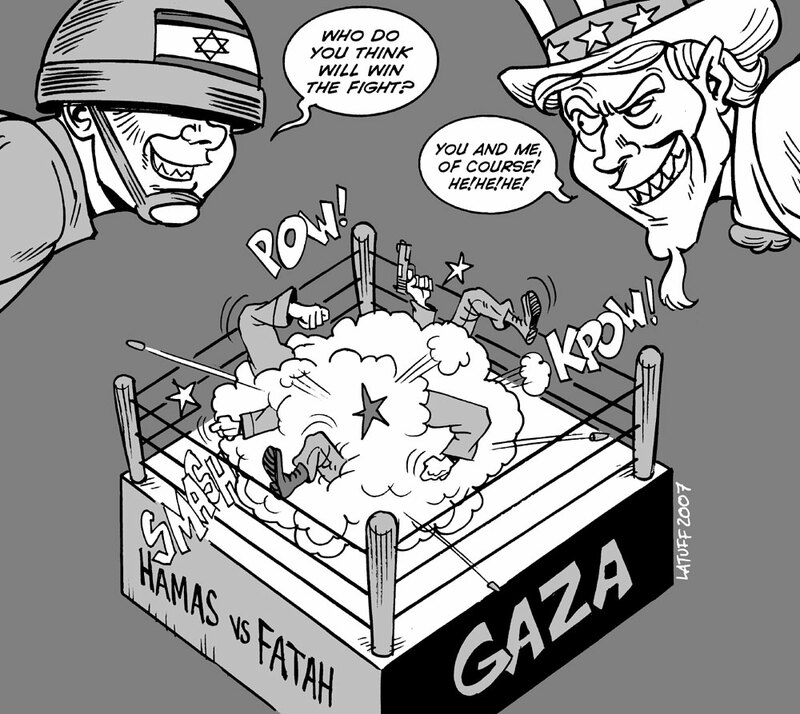 Carlos Latuff, a staunch supporter of the Arab Spring, is also a font of vitriol against Israel, because Allah forbid that the Jewish State might improve its relations with the recently liberated Arabs. 5. 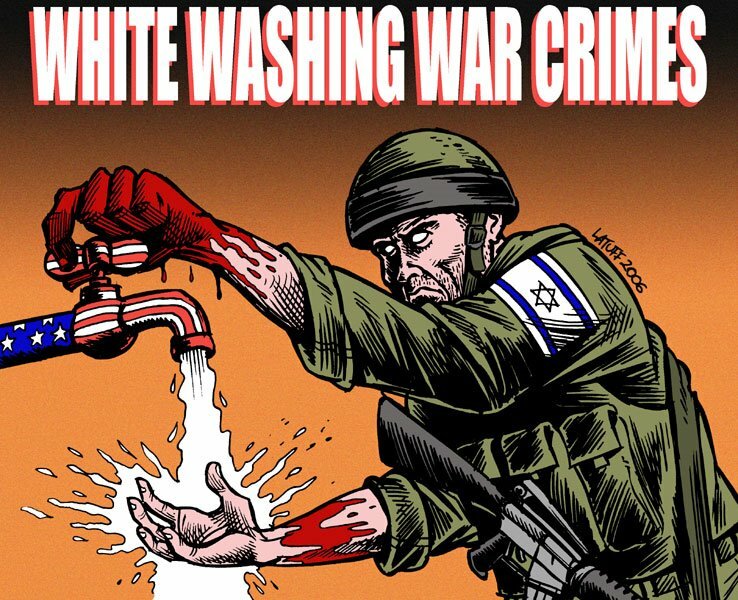 Ethnic cleansing is a charge thrown at Israel by editorial cartoonist Carlos Latuff, and it’s what he hopes Palestinians will do to the Jewish State. 4. Maybe it’s not fair to judge Carlos Latuff entirely by the body of his work, but it’s fair to do a Top Ten joke list about his hatred. 3. 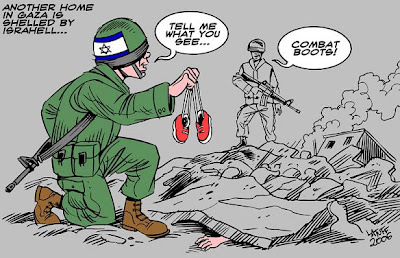 You can’t judge a book by its cover, but you can judge editorial cartoonist Carlos Latuff by his anti-Israel cartoons. 2. 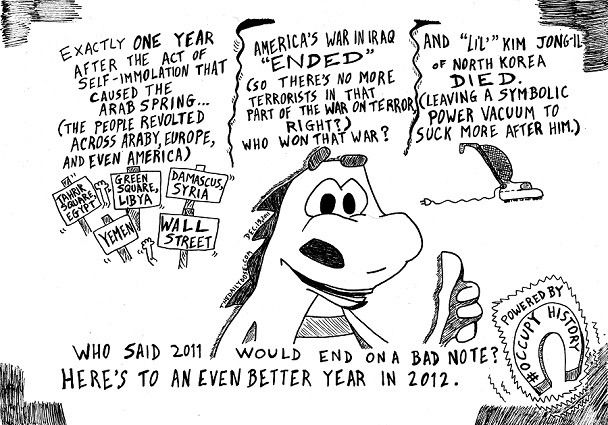 Political cartoonist Carlos Latuff wants peace (without Israel) in the Middle East. 1. Carlos Latuff is not a terrorist, proving he’s smart enough to know that his pen is mightier than their bombs. Signup to get the latest from Laughzilla by email.